Pour les lecteurs Français, vous pouvez retrouver une version française ici. First of all, what is XNA in a few words ? 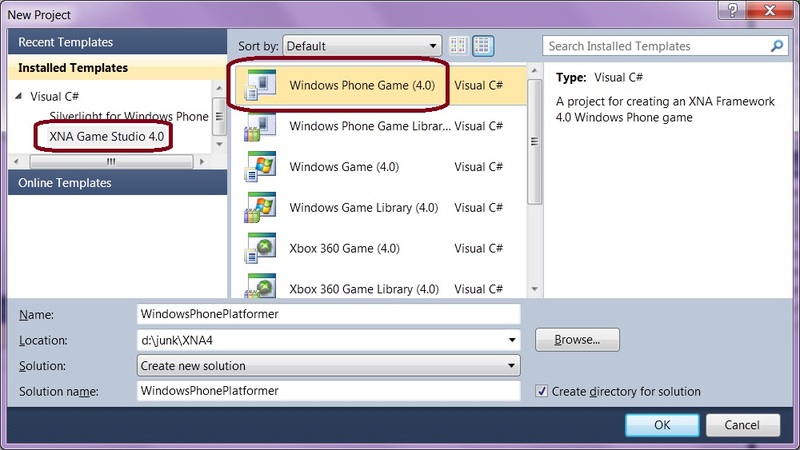 XNA is framework developed by Microsoft to help you building video games in an easy manner. It’s a managed wrapper on top of DirectX. It’s also a multiplatform framework. XNA Studio 3.1 was targeting for instance PC, Xbox 360 and the Zune (HD) device. 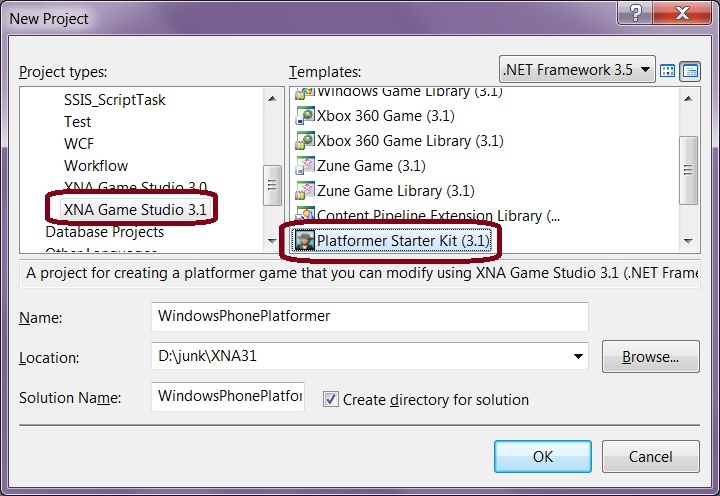 XNA Studio 4.0 is targeting PC, Xbox 360 and Windows Phone 7 Series devices. The main advantage is that you’ll be able to reuse around 90% of the same code on the 3 platforms. The remaining 10% will be linked to each platform’s specifics: native resolution, type of devices available, sensors available or not, gameplay optimization, etc. First time I’ve heard about XNA was during an internal Microsoft conference in the US few years ago. During one session on XNA, the development team was pointing us to the fact that few developers had the set of skills needed to build games on top of DirectX. For me, there are 2 obvious main reasons to that: DirectX is a COM model only accessible through C++ and there are a lot of concepts to master before starting seeing the first pixels moving on the screen. The idea was then to simplify the concepts through a higher level framework to provide young students and passionate people a first mean to discover how to build games without handling all the plumbing. Once this step done, they will be potentially detected by video games editors that will train them on DirectX for more complex games. The XNA framework is then providing solid bases to build a video game. Note : XNA Studio 3.1 as well as XNA Studio 4.0 are free and work with the free versions of Visual C# Express. All resources linked to XNA can be downloaded from here. Once done, we will then have in the target directory all the needed source code and resources (sprites, levels, songs, sounds, etc.) to work on. Let’s use the Zune project as a base. Indeed, this version is displaying the game’s levels using the height rather than the Xbox 360/PC versions that display the blocks in a widely manner. There is no migration wizard available to update a XNA Studio 3.1/VS 2008 solution to XNA Studio 4.0/VS 2010. However, hopefully, this is not a very complicated task to achieve. It’s mainly a brutal copy/paste operation. You then need to import the various source files from the XNA 3.1 project (Player.cs, Level.cs, Tile.cs, etc.) into the main XNA 4.0 project. Then, you need to import the game’s resources in the content project. Indeed, first difference between XNA 3.1 & XNA 4.0, the resources (handled by the Content Pipeline) are now shared between each platform (Xbox 360, PC & mobile phone) whereas there were copied in each project before. Once imported, you’ll notice that the solution won’t compile yet. Indeed, some parts have changed between XNA 3.1 & XNA 4.0. In our case, the only parts of the code that need to be updated to allow compilation are linked to the files accesses. There is 2 parts of the code you’ll need to modify. // Try to find the next level. They are sequentially numbered txt files. The ‘1’ character indicates where the player will start the level, the ‘#’ character the blocks on which the player can jump, the ‘G’ the diamonds the player takes to score and the ‘X’ the level’s exit. Each association are described in the LoadTile() method. You can see above the level 0 description for the Zune splitting the screen into 8 columns and 16 lines. To finish on this part, in order to be able to properly compile, you’ll need to change the properties of each level’s text file to change the “Build Action” property from “Compile” to “None” and the “Copy to Output Directory” from “Do not copy” to “Copy if newer”. You’ll need also to modify some sounds content properties to change the value from “Song – XNA Framework” to “Sound Effect – XNA Framework” (except the music itself of the game of course). These slight modifications are linked to the brutal copy/paste operations we’ve done before. The Content Pipeline has just assumed some wrong default properties. We’ll then need to modify a bit the code and some design elements in order to make them matched the Windows Phone resolution. We then need to handle the windows phone case. Let’s first try to understand how the levels are drawn. - Levels are described inside text files with 15 lines and 20 columns. - We then have blocks of 720/15 = 48 pixels height and 1280/20 = 64 pixels width. We named them “Tile” in our game. Their size will then be 64x48 pixels on PC. - Levels are described inside text files with 16 lines and 8 columns. - We then have blocks of 320/16 = 20 pixels height and 240/8 = 30 pixels width. The size of our tiles will then be 30x20 pixels on Zune. Indeed, if you go to the “Tiles” subdirectory of the “HighResolutionContent” (for PC/Xbox) and the “LowResolutionContent” (for Zune) directories, you’ll notice that the size of the images used for these tiles are exactly 64x48 and 30x20. In my case, I’ve decided to use the following values for the phone. - I’d like to reuse the Zune levels described with 16 lines and 8 columns. - We then have blocks of 800/16 = 50 pixels height and 480/8 = 60 pixels width. 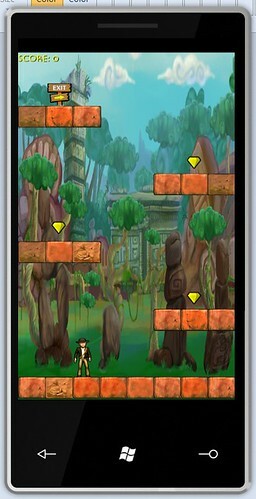 The size of our tiles will then be 60x50 pixels on Windows Phone. Now that we’ve done some decision on the resolution, we now need to update the sprites and the code accordingly. For the sprites, I’ve reused the samples provided inside the “HighResolutionContent” and I’ve resized them thanks to Paint.NET. We’re then going to review the gameplay to match the phone features. I’ve chosen these values myself based on the few tests I’ve done within the emulator but feel free to change them as you wish! The very last step is to be able to play the game without a keyboard or a gamepad. For that, we could imagine using the phone’s accelerometer in order to move the main character on the left or on the right when the user will rotate his phone on those directions. 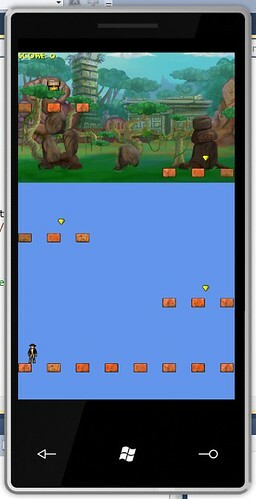 When the user will tap the screen, we will make jumping the hero. However, the way to handle the accelerometer is slightly different between the Zune HD and the Windows Phone. For instance, we don’t have (yet ?) the AccelerometerState class. To solve that, you can use the suggested code from this article: Windows Phone Accelerometer Support in XNA which provides a wrapper on the AccelerometerSensor class to be able to have a copy of AccelerometerState. Once this wrapper inserted in your project, you should be able to use as-is the previous code initially designed for the Zune HD. Unfortunately, I haven’t tested the accelerometer and the touch sections of this project as we don’t have any Windows Phone 7 Series devices in France yet… 🙁 However if you’re one of these lucky guys currently having one of these prototypes in your hand, feel free to tell me how the code behave on your highly desired phone! Since I’ve started coding, I've always secretly dreamed (as many of you I guess!) to participate into the conception of a video game. Indeed, to my point of view, this has always been one of the most complex and stimulating kind of development. However, up to now, I’ve been constantly thinking that I wasn’t good enough to face the mountain of details implied by this kind of project. XNA makes me feel that I can face them for the first time! I hope that this will give you the same feeling and that we will soon discover your great games and creativity on our phone. Wow very cool blog entry and very nice port, do you have complete udates for the new beta yet. noticed some issues with reference assemblies etc. in the latest beta from your live drive latest code update.. Very nice to see all in all.. I assume I am missing something very simple. I just don't know what it is. The latest version I've published is here : blogs.msdn.com/…/sl4-xna-platformer-level-editor-pour-wp7-le-jeu-xna-4-4.aspx . 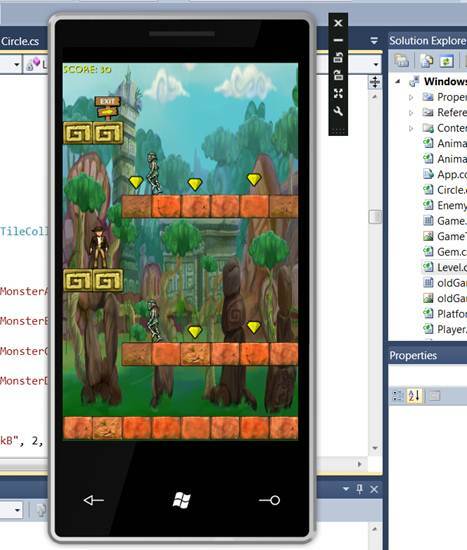 It's very easy to recompile it with the RTW version of the WP7 SDK. @jsteph1967: I've the same error: Cannot find importer "TextureImporter". I'm try to use the last version, linked by davrous. I cant load some levels. I fixed the import references bug, but it cant load some levels. Actually i am really surprised, how the levels should come to the isolated storage, if they arent written there yet? I want to develop a tic tac toe game using the multicast channel, but i only want 2 players to join this multicast channel , how can i do this??? ?